I blog; therefore I exist. OR I exist; therefore I blog. Anyhow, the blogging's been pretty scarce around here! Sigh. Turns out I can't do it all. (Smile) It's that Revelation study I'm in, I tell you! Fascinating! And time-consuming! I highly recommend it. On another note: Lily, Katie and I are going to Disney World next week! We're meeting up with my mom. 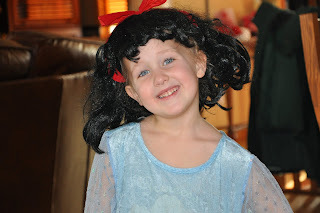 Here's Lily in her Snow White wig. She thinks she should take it along. I told her I'd see what you all think! Do it! Sophie wore her Snow White dress there the whole day and everybody loved it!